If you were unable to get a ticket to last Friday’s Albina Soul Revue at the Alberta Rose Theater XRAY has you covered! Available now is the live coverage of the event, originally broadcast Friday 11/16 and currently streaming on XRAY.fm. See below for the audio and more information about the event. 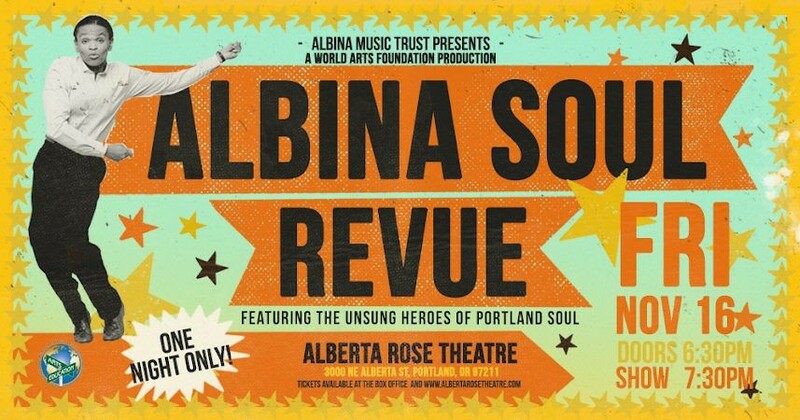 The Albina Soul Revue is a community soul music showcase of historic proportions. The event features musicians of color once active in the Albina area of North & Northeast Portland. Performing original selections from the 1970s, these artists and their music represent a lost era in Portland soul. Chronically undocumented, Albina soul music was rarely released—even on vinyl. Through the efforts of Albina Music Trust, this material has been carefully preserved and is now ready for the stage once again. This show offers a unique glimpse into a time in Portland where the funk was undeniable and the horns, harmonies, and backbeat were always on the one. Not to be missed!